The Family Connection: Are you who you think you are? 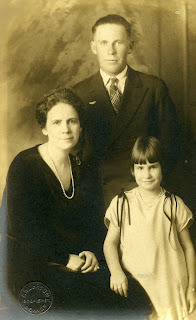 A recent internet discovery, of photos and distant cousins, got me looking into my husband's side of the family again. His great grandmother was Mabel Ora Risheill. She was born in Kansas but was in Denver,Colorado by 1897. I knew that she married Noel Lane Roberts and that they had one son, Floyd, my husband's grandfather. I was able to trace the Roberts family back to the 1700's in Buncombe County, North Carolina. Over the course of the years they made several mass migrations. First to Gilmer, Georgia, where the moved onto former Cherokee Indian lands. Next a group migrated to Texas, settling in the north of the state. Then, quite a few went to Colorado where they tried farming, ranching and mining for a living. Mabel's family had also be on the move. The Risheills came from Pennslyvania, on to Henry County Illinois, made a pass through Kansas, and finally to Denver, Colorado. In the 1910 census Mabel lived at the family home in Denver, she was a cashier at a theater in Denver. Noel lived in Texas, hundreds of miles away, at his family home. At what point he moved to Colorado is unknown and how these two met is anybody's guess. In the 1920 census the Roberts family, Noel, Mabel and their son Floyd, was living in Creede, Colorado. Creede was a mining town in Mineral County. Noel was a rancher and Mabel ran a hotel/boarding house. The only sticking point to this scenario was the age of Floyd, listed in 1920 as thirteen years old. This would give him a birth date of 1907. This date is not consistent with the 1910 census, as he was born while his parents lived in different states with their own parents. I left the issue alone, maybe the census was wrong or there was some other explanation for the discrepancy. Today, I was looking once again at Mabel and decided to search for her marriage to Noel. I found a great website, the Colorado Department of Personnel and Administration (DPA) which had marriages, court case and other vital statistics for Colorado residents. Rather unexpectantly I found a different Mabel marriage. On December 25th 1910 Mabel applied for a marriage license in Denver, her husband to be was not Noel but Forrest Oliver Babcock. Who in the heck was he? No one has ever mentioned that name. A further search reveals a court case in 1914 which resulted in the divorce of Mabel and Forrest and the issue of another marriage license in 1915 for Mabel and Noel Lane Roberts. How in the world could Noel be the father of Floyd, born 8 years prior to their marriage. The only answer I can come up with is that he was not Floyd's father. Now, unknown to you, reader, Mabel's Aunt Kate Coe ran an orphanage in Kansas City Kansas, at which her mother had from time to time worked. One of Mabel's brothers had adopted a child from this orphanage as had Kate Coe herself. I believe that Floyd too was adopted from this or some other orphanage. What other explanation was there. Another possiblility would be that Noel was the father and brought Floyd with him to Colorado, but would he abandon him with Mabel? At some point after the 1920 census Mabel and Noel divorced. Noel fathered an out of wedlock child in 1926 and in 1927 he married Flora Sybil Land. Mabel was married for a third time in 1928 to William Young. William had a young daughter whom she raised as her own. I do not think that Mabel ever had a child of her own. I have never heard any mention of Noel or anything concerning this topic from my husbands family. Do they even know? I spent weeks researching the Roberts family, generating lengthy charts and hunting down family members for information and now it seems that it was all a waste of time. So who is my husband, is he a Roberts, was his father or is our son a Roberts? Who are these people. How much of your definition of yourself comes from who you think you descend from, and are you really who you think you are?